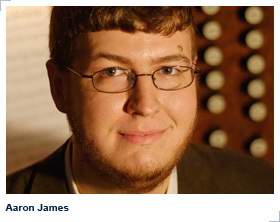 Organist and musicologist Aaron James is the Director of Music at the Toronto Oratory of St. Philip Neri. An alumnus of the Eastman School of Music, he graduated in 2016 with both a Ph.D. degree in musicology and a DMA degree in organ, along with the Performer’s Certificate in the organ. He was the 2011 winner of the National Organ Playing Competition of the Royal Canadian College of Organists, and has won numerous other prizes and scholarships for his organ playing, including first prizes in the Florence and Stanley Osborne Organ Competition and the Howard FaircloughOrgan Competition; he was also a finalist in the 2012 Franz Schmidt International OrganCompetition (Kitzbühel, Austria). He performs regularly as an organ recitalist in both Canada and the United States and has appeared as a soloist with the Eastman Graduate Chamber Orchestra, the Toronto Youth Wind Orchestra, and the Rochester Philharmonic Orchestra. A regular performer of contemporary music, Aaron has given national or world premieres of numerous new compositions, including works by Emily Hall, Martin Herchenröder, Michael Nyman, Daniel Ochoa, and Kyle Quarles. He is a Fellow of the Royal Canadian College of Organists, the College’s highest academic distinction, receiving the Willan and Porter prizes for the 2012 Fellowship examinations. Aaron completed his doctoral studies as an organist in the studio of Edoardo Bellotti, having previously studied with Hans Davidsson and Michel Bouvard at Eastman, and with Paul Merritt at the University of Western Ontario, where he received the Faculty of Music Gold Medal. His Ph.D. dissertation examined the mid-sixteenth-century German music printer Sigmund Salminger, demonstrating how Salminger adapted and transformed older repertories of Franco-Flemish polyphony for the religiously divided public of post-Reformation Augsburg. Aaron’s research has been presented at conferences in Canada, the United States, Belgium, and the United Kingdom, and has been honoured with the Charles Warren Fox Award and the Jerald C. Graue Fellowship; his published work appears in the Journal of the Alamire Foundation and in Early Music. He currently serves as an adjunct instructor of organ literature at the University of Toronto, having previously taught at Eastman and at the University of Rochester.